CHICAGO — It’s going to be so long "O” and hello "Ro" in Chicago’s West Loop. Rosie O’Donnell, a multiple Emmy winner for "The Rosie O’Donnell Show" and former co-host of "The View," is going to help fill the void at Oprah Winfrey’s Harpo Studios when Winfrey retires her nationally syndicated TV program after 25 seasons in May. Chicago Harpo employees were told Monday that O’Donnell’s new one-hour daytime talk show, set to launch this fall on cable’s OWN: The Oprah Winfrey Network, will tape on Winfrey’s soon-to-be-vacated stage in the studio space at West Washington Boulevard and North Carpenter Street. "Hello people of Harpo, it’s me, Rosie O’Donnell, star of ’The Flintstones,’" O’Donnell said, referring to her 1994 film in a homemade video message shown to studio staff. "I just wanted to say: Hi, I’m coming to Chicago. Yes, I am, and I’m thrilled about it. And I get to work with all of you, who have created magnificent television for two decades-plus." Last week Rosie O'Donnell hosted 9/11 family member Bob McIlvaine and engineer Tony Szamboti on her Sirius XM radio show to discuss the buildingwhat.org campaign. A full description of the discussion can be found here and the show can be heard here. Thanks to Jon Gold for providing the audio. Join 9/11 Truth News on facebook and twitter. I'm not certain she will be getting back into the 9/11 Truth debate like she did on The View, but it sure was nice having her encouraging her audience to look further into it then, so it will be nice having her on the air nonetheless. She also interviewed William Rodriguez on the first day of her XM or Sirius Satellite Radio show. If things go crazy in the future, I'd rather have her on TV than off. Rosie O'Donnell is picking up where she left off. On her new two hour timeslot after Howard Stern, Rosie O'Donnell will be interviewing the last man out of the North Tower, William Rodriguez this Friday, November 6th 2009 on Sirius Radio. Willie Nelson recently came out to join hundreds of high level military, intelligence, engineering and architectural professionals who are now demanding a new 9/11 investigation and many now convinced that 9/11 was an inside job. OH, YOU HADN'T HEARD ABOUT THE HUNDREDS OF MILITARY, INTELLIGENCE, ENGINEERING AND ARCHITECTURE EXPERTS . . . WHO SAY WE'VE BEEN LIED TO ABOUT 9/11 ?? What a shock?! Because the below website has offered their statements and concerns to mainstream media. Gosh, wonder why they haven't informed you/us . . . hmmmm. 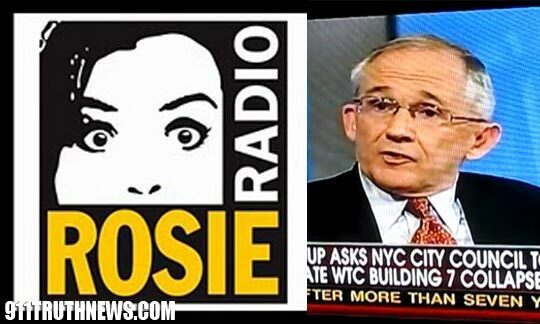 Will Rosie Peddle 9/11 Nonsense on MSNBC? How desperate is MSNBC for another Keith Olbermann-sized hit? Desperate enough, apparently, to give over a big chunk of primetime to someone who honestly thinks the U.S. government was behind the 9/11 attacks. That would be Rosie O'Donnell. I'm all for representing a diversity of views on TV, but there's opinionated and then there's ignorant. Like Creationists and Holocaust deniers, "Truthers," as 9/11 conspiracy types prefer to be known, are by definition people who can't be persuaded by evidence, such as Popular Mechanics's definitive guide to the physics of the Towers' collapse. And what's the point of holding a public debate if one party can't be persuaded? Dennis Miller needs some information. Dennis Miller went on The O'Reilly Show on Oct. 31st, 2007 and discussed his views on 9/11. Dennis Miller commenting on 9/11. Miller commented on Rosie O'Donnell and other radicals who imply that 9/11 was an inside job. "I just want to say to Rosie - if you have some information that George Bush and Rudy Giuliani somehow chose to blow up World Trade Center Building # 7, I as an American citizen want to see that. If you're a patriot and you have that information, you owe it to this country to bring it out." I couldn't fine the video of this segment, but hopefully someone TiVo'd it so we can put it up. I say we take his advice. Please post video and Dennis Miller contact information below. I hope someone can record the O'Reilly Factor tonight. One of O’Reilly’s staffers confronted Rosie O’Donnell during a book signing last Friday night. The person appeared to be Jesse Watters, longtime “Factor” producer who is known to track down celebrities and news makers who refuse to appear on O’Reilly’s show. Watters wanted to know why Rosie would not respond to numerous requests for her to come on the “Factor.” Rosie told Watters that if O’Reilly wants her on his show, he should personally call her. I honestly don't know what to make of this . . .I hope Rosie goes to bat for us. We truthers need to attend to the comments section for this article ASAP! Sure, Rosie O'Donnell's a 9-11 conspiracy nut. But she's also a big-time liberal and ardent Republican critic. That makes her our 9-11 conspiracy nut. So let's literally [see screencap] turn the page on her lunacy. The New York Daily News has the goods. Barbara Walters' ears must have been burning Wednesday night. That's when Rosie O'Donnell mounted the stage at Roseanne Barr 's invitation during her late-night set at Comix on W. 14th. Rosie started off by saying, "When I was fired by Barbara Walters" - the first time she didn't stick to "The View's" spin that her departure from the show was by mutual agreement. Rosie claimed onstage that Walters and other "View" couchmates wear earpieces through which producers tell them what to say, which she refused to do. Rosie also confided that she and the veteran newswoman were actually so close early on in her tenure as moderator that Walters recommended Rosie use Astroglide, which, she added, took her by surprise. "But she paved the way for women," Rosie allowed. "She interviewed Presidents ... "
"Like Abraham Lincoln," snapped Barr. Sometimes I wonder if, when she left "The View," Rosie O'Donnell ever looked in the mirror and borrowed from the 37th President of the United States. "You won't have Rosie to kick around anymore!" Of Course, Richard Nixon never had a blog, Rosie does, and when she's not showing videos of her kids or writing stream-of-consciousness poetry, she's sharing her favorite 9/11 conspiracy theories. Continuation of Volume I with a high quality, updated, 3D in depth analysis.